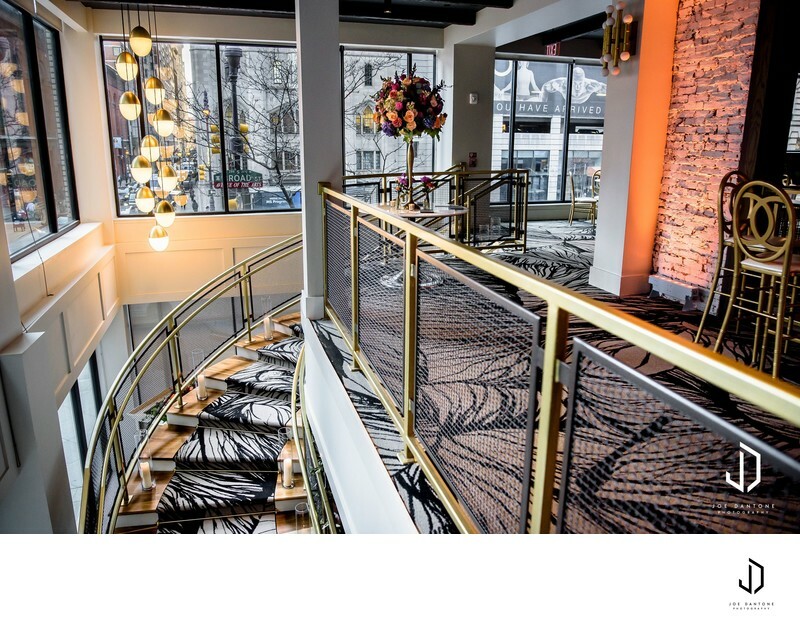 Cescaphe's, The Lucy, was one of the most anticipated venue openings in Philadelphia in 2019. Having a very prime location directly on Broad Street, it opens Philadelphia Wedding Photographer's up to endless photo opportunities. Walking out of the venue you are a very short walk to City Hall. 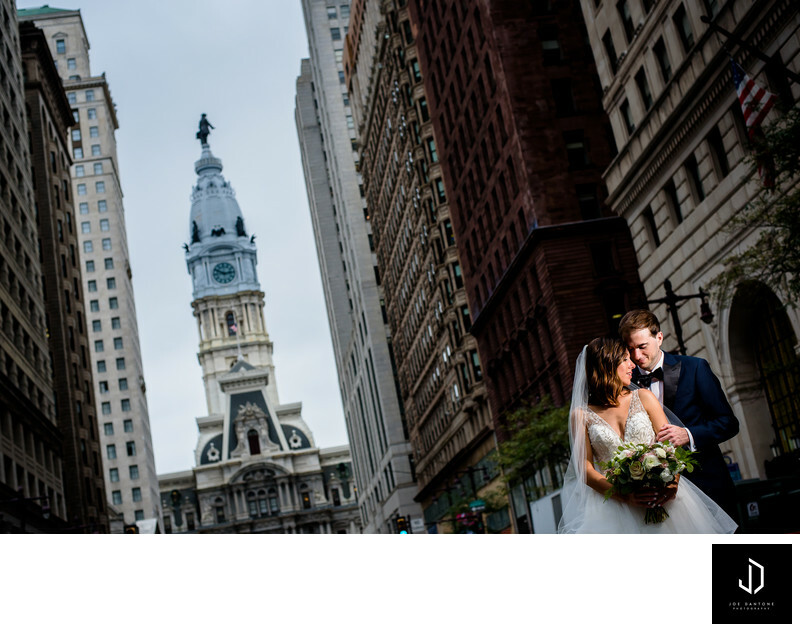 Not only can you capture the iconic Philadelphia Broad Street wedding picture, but you can also shoot inside the city hall property. Walking into the entrance of The Lucy, you are immediately greeted with the overall mood of the entire venue just in your first 10 steps through the front door. 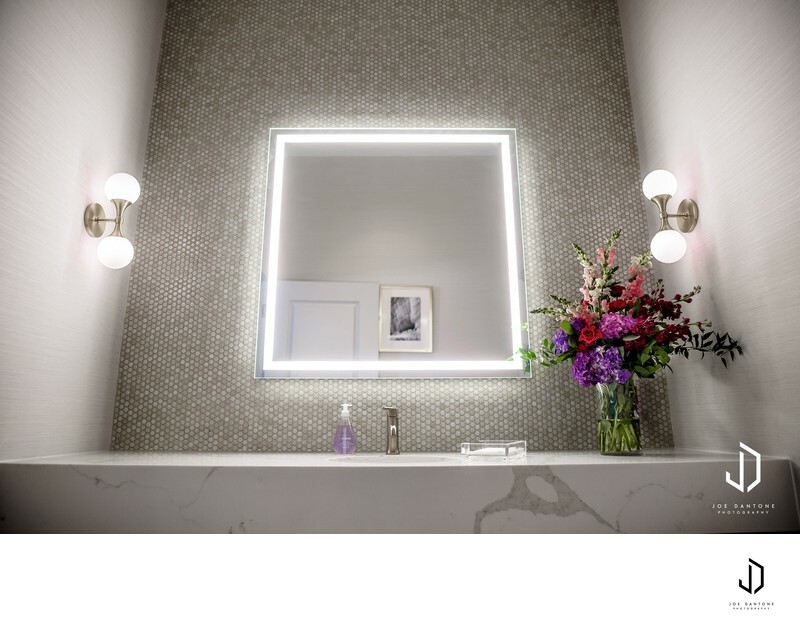 Textures, modern lighting, painted white brick and elegant subtle color tones. Turning the corner you pass by the wrap-around stair case and welcomed into the Massive ballroom. The wonderful thing about this venue is that there is absolutely no other ballroom in the city that has this look or vibe, period. 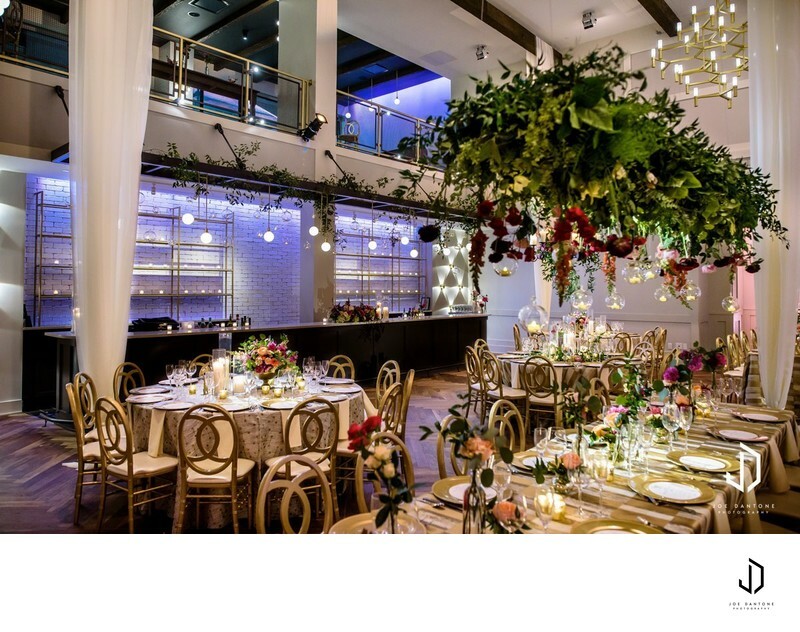 The ceilings are extremely high with mounting points to hang floral arrangements over the tables. The images featured are displaying floral arrangements from Beautiful Blooms. I've been do venues where the DJ/Band area was set up like a stage, and it literally felt like a high school theater stage.The stage and Band area of The Lucy has a totally different vibe, and I'm not sure how they did it. The textures and colors really make the space look modern and elegant. Now the bar...ahem, bar'S. 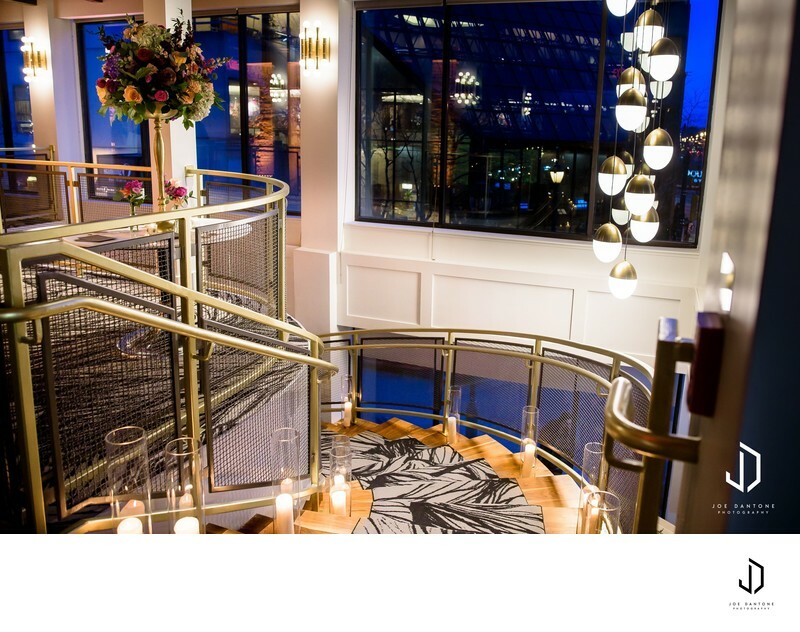 What would a Cescaphe wedding venue be without a grand bar? Whelp, here at The Lucy youcan't miss the bar. It stretches the width of the ballroom floor. The bar has glass shelving, and modern lighting fixtures to create a visually stunning place to grab up your delicious cocktails. Lets head back to those stairs and jump up to the second floor...yes, the second floor. The Lucy has two levels. The second level features 2 more smaller bars and spaces for cocktail hour displays to be set up. 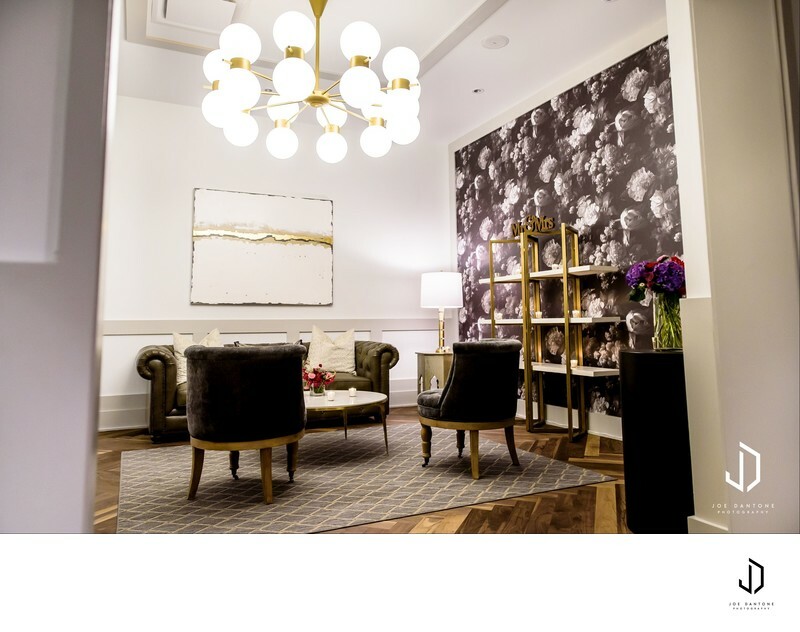 The second floor also features the ultra modern and comfortable bridal suite. The cocktail hour at weddings will be held on this level of the venue. but not until the ceremony happens. 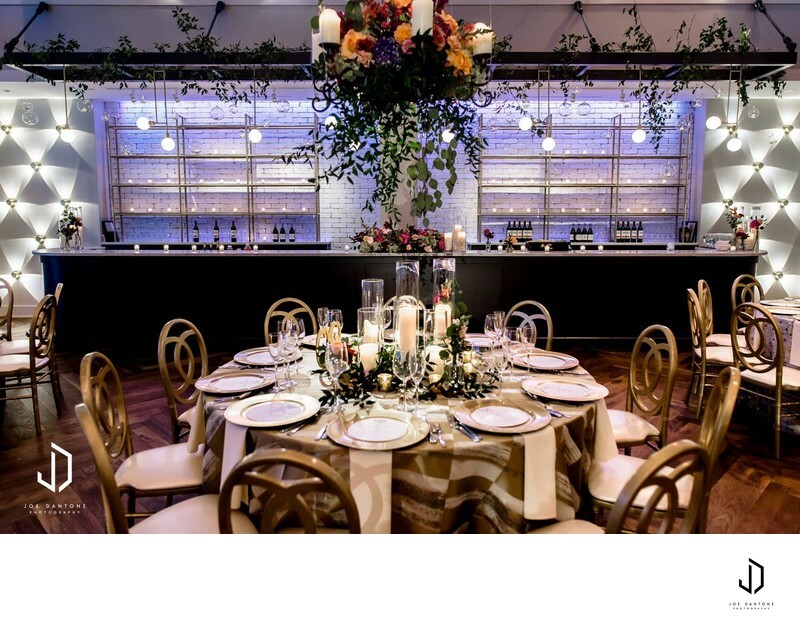 If you are having your ceremony at The Lucy it will be featured in the venue as well. 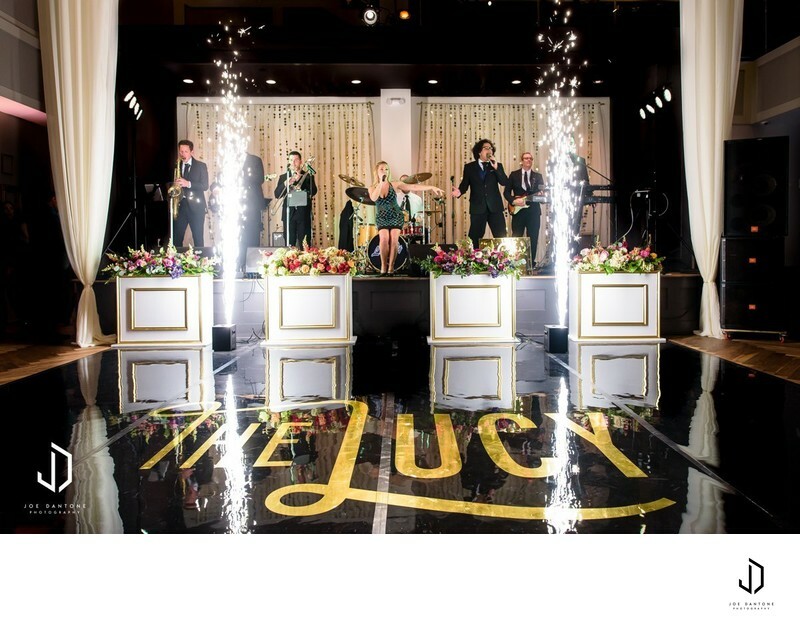 The best part about it is that your guests will not have to wait for a room to be flipped or any visuals of what goes on behind the scenes. 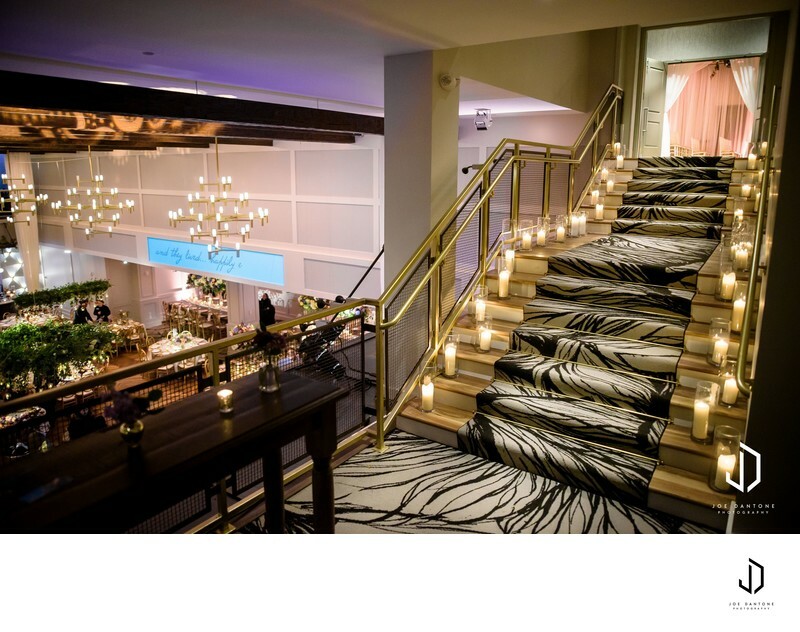 The guests will be led up the steps to the second floor, and up another stair case to a shared space by the hotel next-door, Cambria Hotel. This space will be used for the ceremonies. 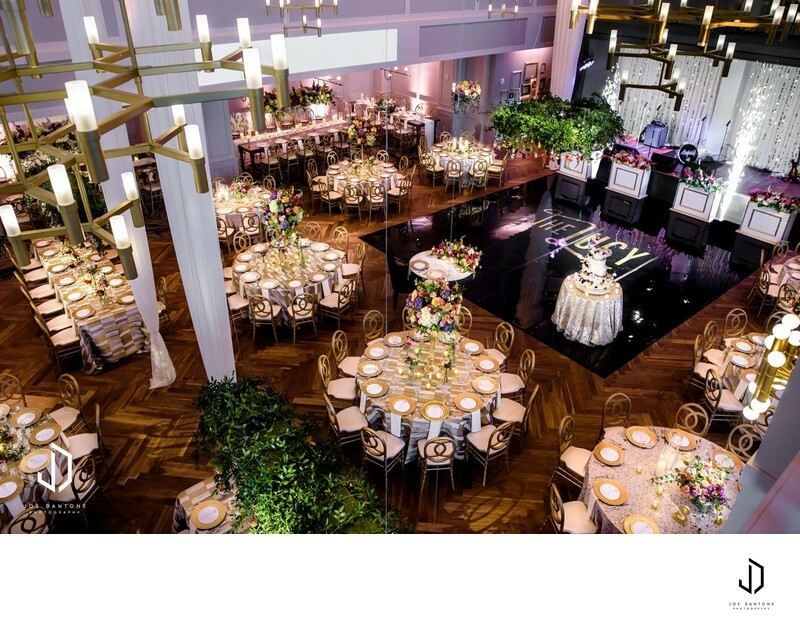 Your guests will come out of the ceremony and be able to view the finished ballroom from the top floor during cocktail hour. 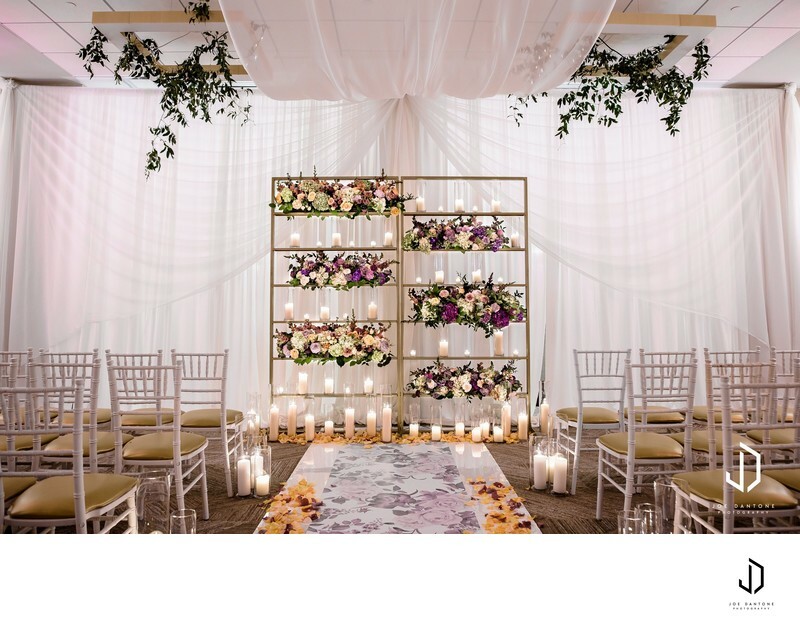 A little bit about me, I am a Philadelphia wedding photographer and photograph weddings and events very frequently for Cescaphe. I'd love to learn more about you and the big day you have planned!